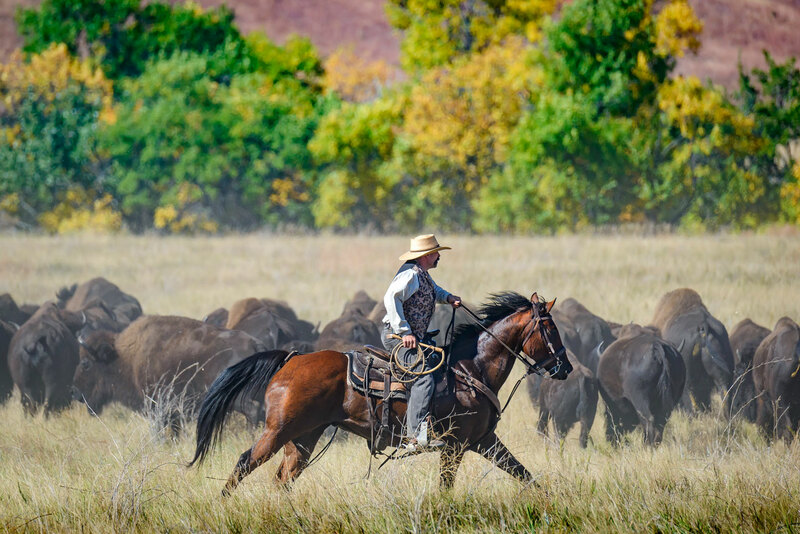 Fall signals not only a change in seasons at Custer State Park, but also a yearly tradition—the park’s Buffalo Roundup and Sale. The park’s modern tie to the American bison (the proper name for the species) extends back to December 1914 when the first bison to be reintroduced to the park were purchased from the famous Scotty Philip herd near Fort Pierre, South Dakota. The approximately two dozen animals were loaded into railroad livestock cars for the trip west to Hermosa, ten miles east of the area then known as the Custer State Forest. By 1916, 50 head of bison roamed the southern part of the 50,000–acre reserve. In following years, Custer State Forest’s creator and advocate Peter Norbeck also reintroduced other species to the area including elk, antelope, mountain goats, bighorn sheep, and even moose for a time. In 1920, then-South Dakota Governor Norbeck successfully lobbied for the Forest’s renaming to Custer State Park. Today, Norbeck’s vision and efforts continue to provide a legacy in South Dakota’s Black Hills. The Park has grown to slightly over 73,000 acres, and still promotes the rich cultural, recreational, and natural attributes that inspired Norbeck during his first visit in 1905. The bison herd has thrived over the years, and the summer herd averages near 1500 each year. While the park’s ecosystem sustains the bison quite well, the size of the herd must be reduced annually to make sure there is a sufficient, renewable habitat for all of the species of the park. In November, the bison that are culled from the herd are sold by sealed bid, or at a no reserve public auction. The proceeds of the sale are used to help fund the operation of the park, to maintain the integrity and health of the existing herd. Some animals are sold to the ever-expanding market of ranchers who specialize in bison while others may go to bison preserves in other locations in the United States or Canada. This year, the bison sale will be held on November 20th at the bison pens on the Wildlife Loop Road south of the South Dakota State Game Lodge. The public is welcome at this event. The roundup and sale offer chances to see the animals up close – Do not approach them as you travel through the park – they are deceptively fast and very dangerous!